One of the things I love best about being a blogger is meeting remarkable people who are making a difference in the food allergy community. Recently, I met such a person, a college student about to graduate named Amanda Merrill. Amanda won the giveaway Amanda’s Own Confections and I ran a few weeks back. Coincidentally, she shared the first name of the owners’ daughter, which the company was named after. As Amanda and I emailed back and forth, I knew right away that I had to share her story. Though Amanda was in the middle of final exams at Tufts University, in Boston, she took the time to answer my emailed questions. 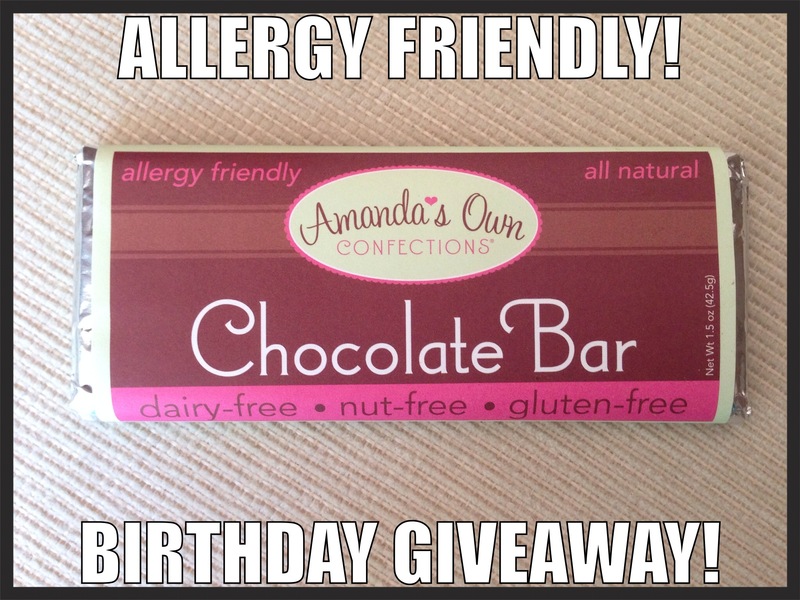 An Allergic Foodie: Congrats on winning the allergy-friendly chocolate bars, Amanda! In an email, you mentioned your senior honors thesis has to do with food restrictions . . . can you elaborate? Amanda: Happy to, and I’m thrilled to win the chocolate bars because with my allergies it’s almost impossible to find chocolate I can eat. The title of my thesis is “Is Gluten-Free Worth the Price?” Basically, I looked to answer two questions: 1) if consumers are willing got pay extra for gluten-free certification, and 2) if so, how much are they willing to pay? This is the first study in this area, and I devised my own survey to distribute. In short, I concluded that consumers are willing to pay a premium. I am planning on publishing my findings in a journal. 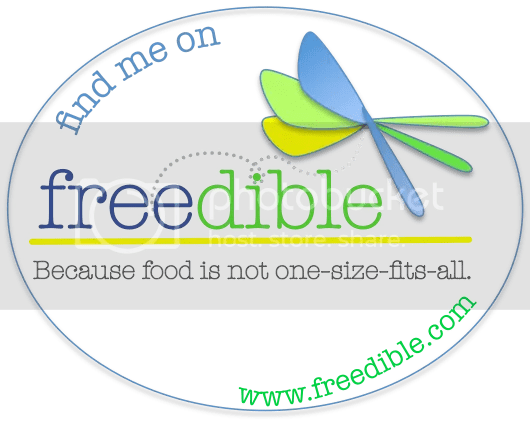 An Allergic Foodie: I know you came up with this topic because you yourself have many food restrictions. Did you always have food allergies? Amanda: As a young child, I was first allergic to tomatoes, potatoes and chocolate, which was very hard for me because my dad is Italian and my mom has an Irish heritage. I couldn’t eat any of their traditional dishes. Luckily, I mostly outgrew these allergies –especially the chocolate! Around middle-school, I started becoming violently ill after eating and I broke out in this terrible skin reaction that left me unable to even open my mouth. I saw many dermatologists who couldn’t figure out what was going on, and I did all sorts of dye and metal allergy tests. My mom was the one to ask for food allergy testing; that’s when I found out I was allergic to soy, nuts and beans. I still wasn’t feeling 100 percent and with more testing, I found out I was allergic to wheat. I have luckily never been hospitalized for a reaction, but I always carry an epi-pen because some of my allergies are life-threatening. An Allergic Foodie: You said you “outgrew” some food allergies, have you developed any new ones and/or other health issues? Amanda: I get tested for food allergies yearly. I am now only “borderline allergic” to tomatoes and potatoes so I can usually handle then in moderation and in small amounts. Unfortunately, some of my other allergies are worsening, and this year I discovered I’m allergic to apples, pineapple and sesame. I also have extreme seasonal allergies to everything from grass, pollen, dust, and mold to dog, cats and rabbits. I also suffer from IBS as well as a slow-moving colon and stomach-emptying processes, which constantly leaves me feeling bloated. An Allergic Foodie: Your food restrictions must make dating and eating out difficult. How do you do it? Amanda: If I am going on a date that involves going to dinner, I often spend hours researching restaurants, menus, policies, and contacting managers to coordinate a meal. One time, I was out in Boston and when the waiter brought over the manager, I began going through my allergies and making adjustments, etc. At one point, the manager, jokingly, told me that he might as well put me in a rabbit cage with a piece of lettuce and a water bottle. The funny thing is, I’m allergic to rabbits as well! An Allergic Foodie: I have a son in college dealing with celiac disease and I’d love to hear your tips for eating in a school setting. Amanda: When was looking at schools, I was really concerned about how I would eat. 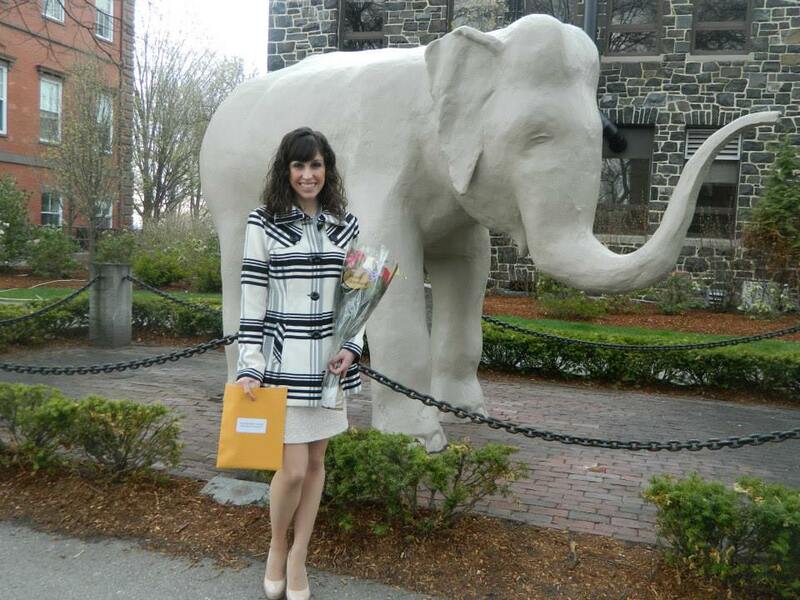 When I arrived at Tufts, I met with a nutritionist/dietitian on campus. I’d advise any student with food allergies to research everything they can about the potential school’s dining services and to meet up with a nutritionist to discuss an eating plan. In Tufts University’s dining hall, a nutrition card is placed above every food and condiment; the cards list every ingredient and has an allergen statement. The problem I run into is that Tufts, like many other dining halls, have all sorts of sauces, marinades, breading, etc. that contain wheat, soy, or another one of my allergens. I often cannot eat much or anything offered for meals and often end up eating a lot of salads and plain grilled chicken. Since I cannot eat many dinner food items, the chefs prepare a separate meat for me–chicken, pork, or steak. They use a separate pan and just cook in olive oil, salt and pepper. Tufts had never had to deal with a student with so many allergies before, so I worked with the nutritionist to get more allergy-friendly choices. Now there is a separate refrigerator/freezer for items such as gluten-free breads, bagels, pizza crusts, and other baked goods as well as a special shelf with gluten-free cereal, granola, ice cream cones, and peanut butter and jelly–there’s even Sunbutter for those of us allergic to peanuts. I have my own special area for my foods that don’t contain my extensive allergies, and I even got the school to change to a soy-free cooking spray. An Allergic Foodie: That’s so great that you’ve made a difference for future allergic students going to Tufts. I think you also are involved with FARE . . .
Amanda: I put together a team to walk in the Walk for Food Allergy Boston to raise money to assist in research for a cure. I hope to continue researching and advocating for food allergies in more ways post-graduation and would love to get more involved with FARE. I try to pass along their messages and awareness information as much as I can. An Allergic Foodie: I love that you don’t let your food allergies hold you back! What are your plans after graduation? Amanda: My double major is in Mathematics and Quantitative Economics. I will be working in a pricing and risk analyst position while taking the actuarial exams. My goal is to become a certified actuary. Also, I have been dancing since the age of three, taking ballet, tap, and jazz. At Tufts, I joined the ballroom dance team and competed in all ballroom and Latin dance styles. After graduation, I want to get back to studying classical ballet and pursue my dream of taking classes at Boston Ballet. Dancing is and has always been one of my passions aside from academics. An Allergic Foodie: Thanks so much for making a difference, Amanda, and good luck with your job and dance– you are an inspiration to other college students with food allergies. An Allergic College Student Your Just Have to Meet originally appeared at Adventures of an Allergic Foodie. If that headline got your attention, you’re probably a chocoholic like I am. Did you also say this mantra when being tested for food allergies? Please don’t let me be allergic to chocolate. Please don’t let me be allergic to chocolate. Please don’t let me be allergic to chocolate. Ha! You ARE a chocoholic like me! Fortunately, to my great relief, I am NOT allergic to chocolate! Unfortunately, I AM allergic to dairy, eggs, soy, gluten, corn and vanilla–all ingredients that are typically found in most chocolate. For a long time, I was sad. Very, very sad. Especially during Valentines Day and my birthday. And maybe also Thanksgiving and Easter . . . and all the days in between. But now I’ve recently discovered Amanda’s Own Confections. Actually they discovered me (thank you! thank you! ), and it just so happens the month of April is both my celiac college son’s and my birthday month. Yes, I know the lemon in the sunglasses looks way too young to have a kid in college (or perhaps that’s why An Allergic Foodie uses a lemon for a Gravatar! LOL!). Anyway, back to chocolate. To celebrate our birthdays, Amanda’s Own Confections wants to give one lucky person a present–a box of chocolate bars! That’s right! An entire box. TWELVE BARS OF GLORIOUS CHOCOLATE. Here’s what you need to do to enter (you only have to do one, but if you do all I will do a happy dance and post it on You Tube*). Write a comment below telling me how much you love chocolate (and my blog, of course). Follow @anallergicfoodie on Instagram and like one of the pictures of Amanda’s chocolate bars. I’ll be posting several. Like my Facebook Page and give a thumb’s up to one of my posts mentioning Amanda’s Own Confections. Pin this blog post on Pinterest. The contest will end on Tuesday, April 22, 8 PM EST. Must live in the U.S. to enter. *I won’t really do a happy dance on You Tube because my sons, and maybe my husband, would be mortified. Chocolate! Allergy Friendly! Free! first appeared at Adventures of An Allergic Foodie.